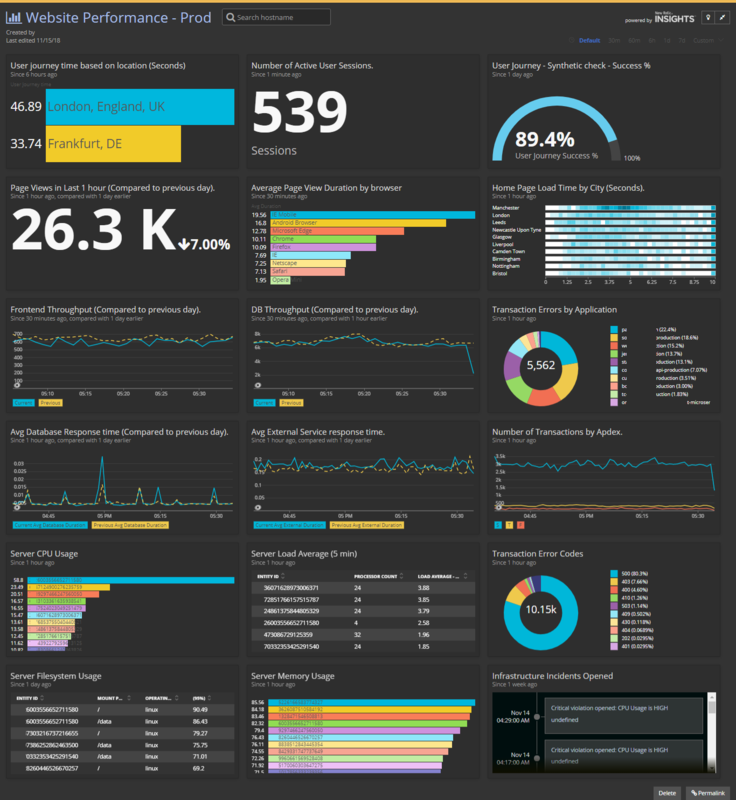 Shared Dashboards Contest—Add Your Queries Here! 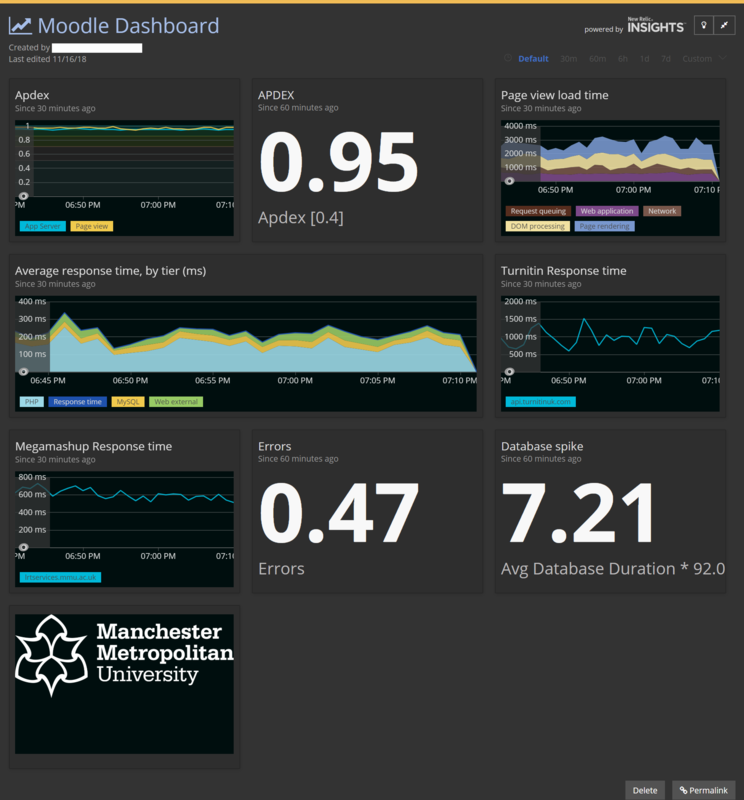 Participate in our Shared Dashboards contest for a chance to win an Apple Watch! You’ve built your New Relic dashboards for a reason. 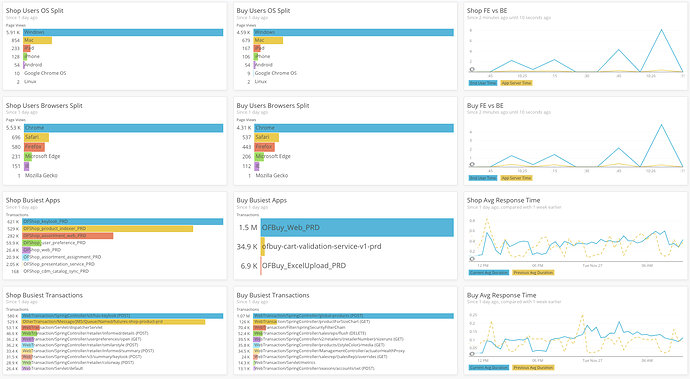 Whether it’s to ensure customers apps are running smoothly, or tracking the velocity of deployments, your dashboards tell the story of your business. 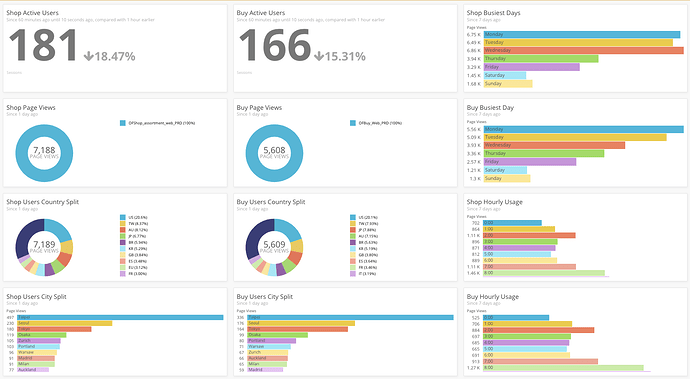 We want to spread the dashboard love by encouraging you to share the chart queries and dashboards that tell that story. On November 26th, 2018, New Relic will kick off our Shared Dashboards contest! You’ll have two weeks to share your most useful queries, Insights charts, and your most awesome dashboards. Contest winners will be announced, live on-stage, at FutureStack Chicago! What are you waiting for? Share the story of your business and you can win an Apple Watch! Participation is as easy as 1-2-3! Shamelessly promote your dashboard! Getting other community members to vote on your submission increases your chances of winning. The entry with the most community votes – WINS BIG! Participation notes: If your dashboard exposes any private data, we will work with you to anonymize your entries. Don’t hesitate to message us with any questions and we’ll do our best to help you participate. For hints and tips and detailed instructions, check out our Dashboard Contest Level Up post! Everyone is free to try these queries and dashboards for yourselves and vote for the ones you love! You’ll be learning something new and helping to select one of the grand prize Apple Watch winners. If you need some inspiration, be sure to check out the Dashboard of the Day posts that we will be publishing in the Shared Dashboard category. These dashboards were created to illustrate the different ways you can get value from your data. Feel free to not only take what they publish to use for yourself, but follow a similar template and structure for sharing your own queries and dashboard solutions during this contest. > This dashboard will work on the standard New Relic data models and does not require any custom attributes or events. In this section, please go into the details on the purpose of each of the charts you are sharing. 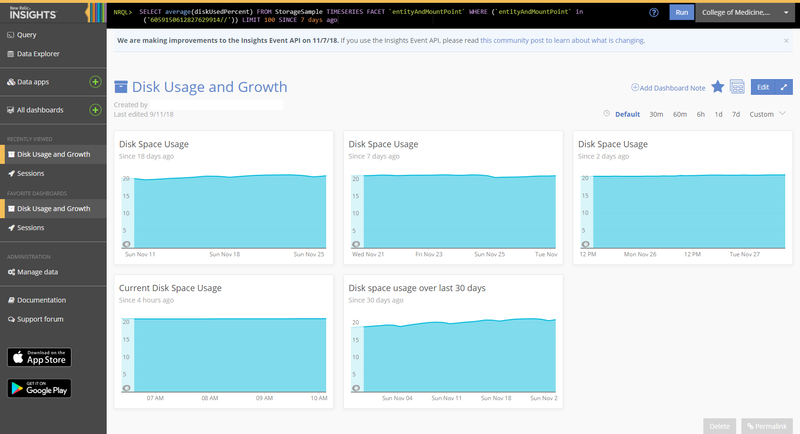 Be sure to also show the query ([NRQL](https://docs.newrelic.com/docs/insights/nrql-new-relic-query-language/using-nrql/introduction-nrql)) that others can cut/paste into the [Insights query bar](https://insights.newrelic.com). Here's some [quick tips](https://marktocreatethisdoc) on how to do this. "nrql": "SELECT * from InfrastructureEvent"
We’ll be giving out a special New Relic developer program t-shirt to anyone who makes a submission during the contest during November 26, 2018 - December 9, 2018. There will be two contest winners: The Community Choice Winner and our Relic Choice Winner! The Community Choice Winner is the Explorer with the most votes from other users. The Relic Choice Winner will be chosen by New Relic product leadership, executives, and big wigs! Our two winners will win a New Relic branded series 4 Apple Watch! And these two winners will be showcased during the keynote presentation at FutureStack Chicago. The sooner you post, the sooner the polls go up! Good luck and have fun! 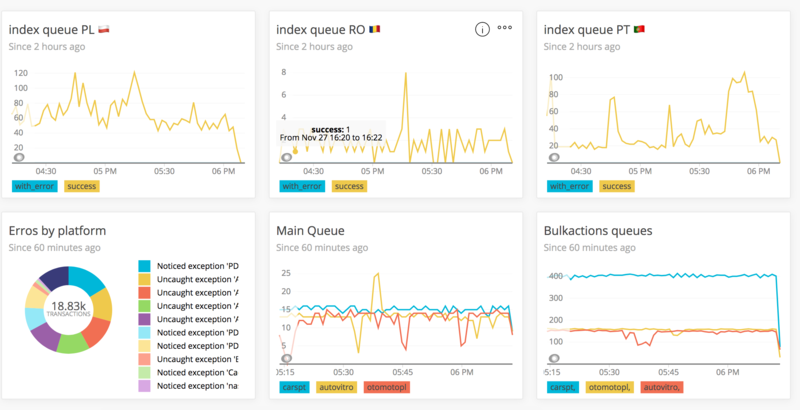 The New Relic Shared Dashboard Contest (the “Contest”) will be held from November 26, 2018 to December 9, 2018 (the “Contest Period”). Participants may be eligible to win the prize detailed below. During the Contest Period, all eligible participants who submit a valid entry at discuss.newrelic.com (an “Entry”) will be entered into the Contest. An Entry must include a NRQL Query, a value statement, components of an Insights dashboard, when possible (and provided no private data is included), and whatever other requirements are stated at discuss.newrelic.com. The Contest Period shall close at 11:59pm PST on December 7, 2018. There is no limit to the number of Entries a participant can submit. Participant’s submission of the Entry constitutes their acceptance of these Official Rules. NO PURCHASE OR PAYMENT IS NECESSARY TO ENTER THESE CONTEST. 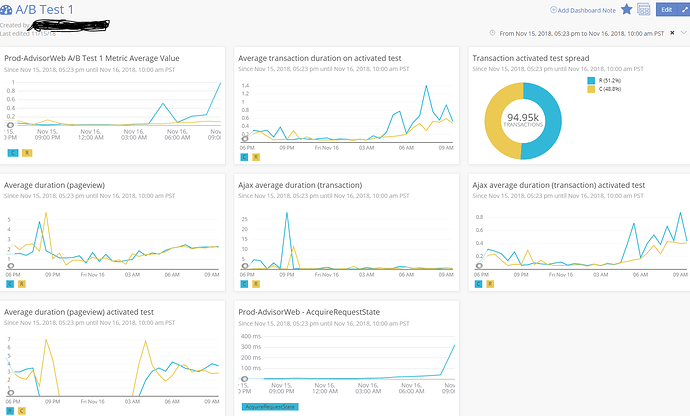 The Contest allows participants to share their dashboards with the wider New Relic community, so Entries may be visible to the public. Each participant grants New Relic and any other participant or member of the public who views its Entry a non-exclusive, royalty-free, irrevocable, perpetual, sublicensable (through multiple tiers) right to use, reproduce, distribute, modify, create derivative works, publicly perform and display and otherwise exploit such Entry (including any screenshots, content, code or other materials provided with the Entry). New Relic may also identify each participant (e.g., using its name and company or New Relic username) in connection with its Entry or the Contest (but has no obligation to do so). 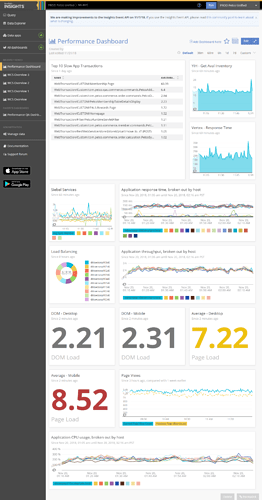 New Relic may take down any Entry from the New Relic website at any time, without notice or liability. Each participant represents and warrants that it has all necessary rights, consents and permissions to submit its Entries and grant the rights above. Two (2) winners shall be determined from eligible Entries on December 10, 2018. The two (2) participants whose Entries received the most votes by other Contest participants during the Contest Period shall win the Contest. The winner(s) will be notified via discuss.newrelic.com and via email using the email address provided in the Contest. Upon signing an eligibility affidavit and waiver, the winner(s) shall be mailed the prize detailed below. If a winner does not claim their prize within seven (7) days of the notice, they shall forfeit their prize and a new winner shall be selected. In the unlikely event of a tie, New Relic will supply another poll for extra voting time to be available for an additional 24 hours. All ties will be reviewed and decided at New Relic’s sole discretion. 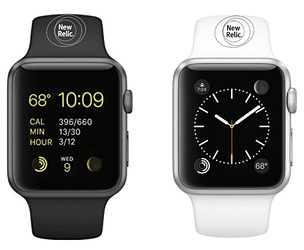 Prize: Two (2) winners will each receive one (1) Apple Watch valued at $400.00 USD. The Contest is strictly limited to permanent, legal United States residents who are at least eighteen (18) years of age. Participants are solely responsible for ensuring their participation in the Contest is lawful. New Relic employees are not eligible to participate in the Contest. New Relic reserves the right, at its sole discretion, to disqualify participants for any reason, including if it is determined that one’s participation in the Contest is not lawful. All participants in the Contest release New Relic, Inc. and its respective employees, officers, directors and shareholders (“Released Parties”) from and against all liability, claims, and damages arising in connection with their participation or inability to participate, entry in the Contest and/or acceptance, receipt, ownership or use of the prize awarded in the Contest, including but not limited to personal injury, death, damage to property or loss of property, use of an Entry, and identification of participants. Before claiming their prize, the winner must execute an affidavit and waiver verifying their eligibility and acknowledging: (i) their responsibility for any taxes incurred in connection with the prize awarded and (ii) that New Relic will not be liable for any injuries caused while operating prizes awarded from the Contest. Each participant further understands and agrees that all rights under Section 1542 of the Civil Code of California (“Section 1542”) and any similar law of any state or territory of the United States that may be applicable with respect to the foregoing release are hereby expressly and forever waived. You acknowledge that Section 1542 provides that: “A GENERAL RELEASE DOES NOT EXTEND TO CLAIMS WHICH THE CREDITOR DOES NOT KNOW OR SUSPECT TO EXIST IN HIS OR HER FAVOR AT THE TIME OF EXECUTING THE RELEASE, WHICH, IF KNOWN BY HIM OR HER MUST HAVE MATERIALLY AFFECTED HIS OR HER SETTLEMENT WITH THE DEBTOR.” The releases hereunder are intended to apply to all claims not known or suspected to exist with the intent of waiving the effect of laws requiring the intent to release future unknown claims. Released Parties are not responsible for any claims, damages, expenses, costs or losses to any person or property of any kind arising from or in connection with: (1) typographical or other errors in the printing of these Official Rules; (2) technical failures of any kind, including but not limited to malfunctions, interruptions or disconnections in phone lines hardware, software, or failure of any email or entries to be received by New Relic due to technical problems, human error or traffic congestion, unavailable network connections on the Internet or any website; (3) unauthorized third party tampering with the Contest; (4) technical or human error in the administration of the prize; (5) late, lost, undeliverable, damaged or stolen mail, or (6) all activities under the Contest. The Contest is governed by and will be construed in accordance with the laws of the State of California and the forum and venue for any dispute shall be San Francisco, California. Participant acknowledges and agrees that survey information collected during the Contest Period will be used for marketing and other internal purposes. New Relic reserves the right to terminate this Contest for any or no reason and at any time without further notice. End user experience :- User journey synthetic check results, user sessions & page view details. Application performance:- Application services & database, response time and throughput. Application Transaction details:- Errors, Apdex score & error codes. Infrastructure performance:- Server CPU, Memory & Filesystem usage, load and infrastructure events. The dashboard provide a high level status of the application platform to support, development and management teams. Required Products: APM, Browser, Synthetics, Infrastructure. 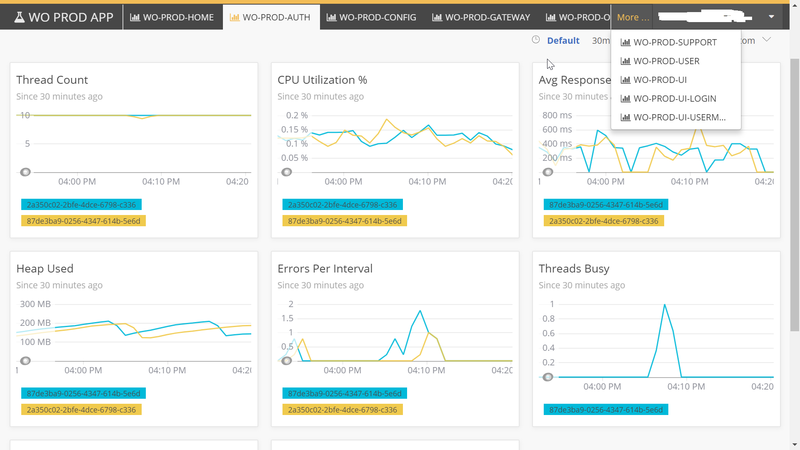 This dashboard will work on the standard New Relic data models and does not require any custom attributes or events. Enabled Event Types: PageView, InfrastructureEvent, TransactionError, SystemSample, SyntheticCheck. Enabled Attributes: appName, hostname, apmApplicationNames, httpResponseCode, entityId. User Journey - Synthetics check - Success %. The success pecentage of My-synthetic-check scripted browser syntheic check, which simulates complete user journey on the website from 2 different loactions on regular intervals. Avg External Service response time. 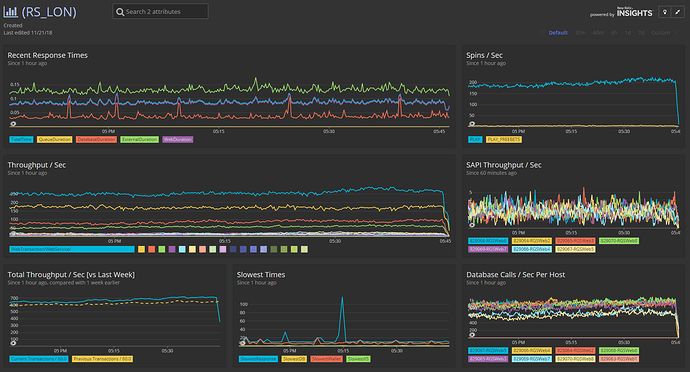 Average duration of external service calls for the past 1 hour compared to previous day. Facetable bar chart of Server memory usage data. (Facet by entityId instead of hostname for security reasons). December 2018 Coffee Chat: Insights & Dashboards & NRQL - OH MY! We have this dashboard spanning multiple TVs mounted in the IT area. 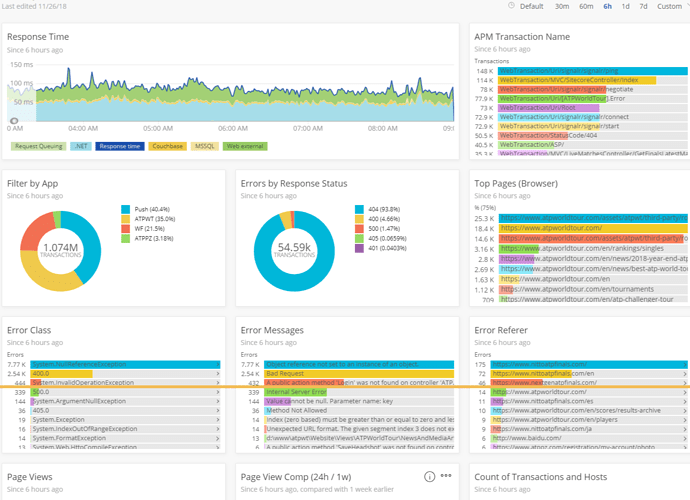 The objective was to show overall performance of all of our sites with easily discernible attributes; and be filterable to the individual APM application level. It’s a bit of a hodgepodge of metrics, but shows several key areas that were requested to be highly visible to anyone that looks at the TVs. “nrql”: “SELECT count() FROM Transaction FACET name SINCE 1 day AGO"
“nrql”: “SELECT count() as ‘Transactions’ FROM Transaction FACET response.status WHERE response.status >= ‘400’ SINCE 1 day ago"
“nrql”: “SELECT count() as ‘Errors’ FROM TransactionError facet error.class SINCE 1 day ago"
“nrql”: “SELECT count() as ‘Errors’ FROM TransactionError facet request.referer SINCE 1 day ago"
“nrql”: “SELECT count() FROM PageView SINCE 24 hour ago COMPARE WITH 1 week ago WHERE appName = ‘ATPWT’"
“nrql”: “SELECT count() FROM PageView FACET deviceType WHERE deviceType != ‘Unknown’ SINCE 1 day AGO"
“nrql”: “SELECT count() as ‘Transactions’ FROM Transaction FACET response.status WHERE response.status >= ‘400’ and appName != ‘ATP-Dev’ SINCE 1 day ago TIMESERIES"
“nrql”: “SELECT count() FROM Transaction where appName != ‘ATP-Dev’ FACET host SINCE 1 day ago TIMESERIES AUTO"
“nrql”: “SELECT count(), average(duration) as ‘AVG’, percentile(duration, 50,75,99) FROM Transaction where appName != ‘ATP-Dev’ FACET name SINCE 1 day AGO limit 100"
Based on that we can find out the performance of API calls and improve it. 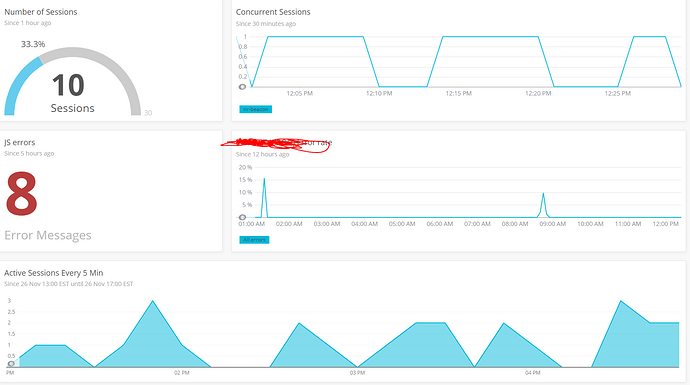 we can see the app memory usages and their behavior.App profiling is done based on the graph spikes.We use synthetic pings to monitor app and create incidents which will be communicated through slack and Outlook. This shows disk usage over time for various periods. I built this because we were having unexpected disk growth that was eating the system and causing it to crash. I wanted to see at a glance what the growth looked like over time, where the spikes were, if any, and try to find a pattern. 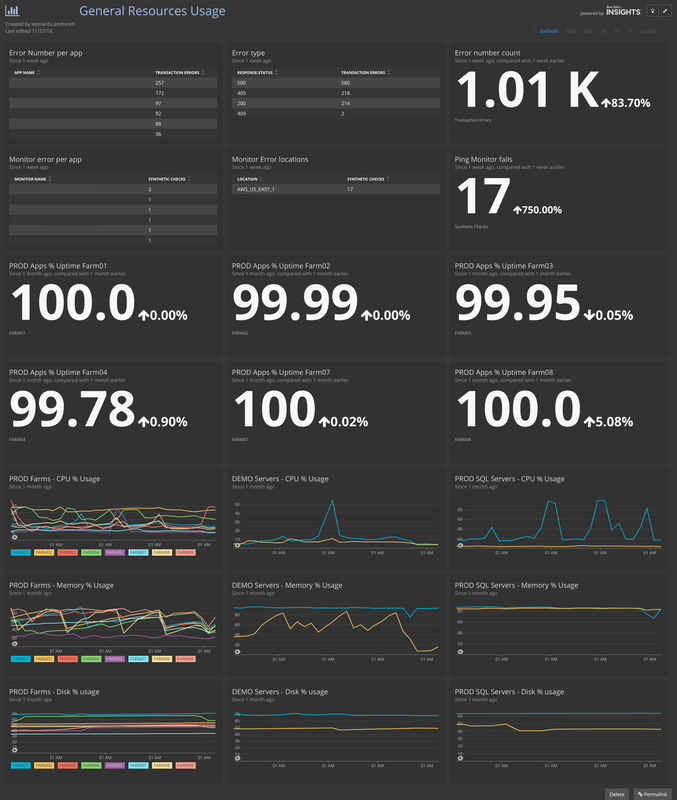 My name is Luis Sabatini, I present my favorite Dashboard. In this panel you can observe the monitoring of servers at transaction level, stored procedures with more load, more used services and different distributions. This dashboard represents some basic health check stats for one of my team’s primary applications. It’s a COTS product, so I’ve kept the information represented to some very basic metrics that we can use to get an “At A Glance” status. Show me the average CPU percent utilization per host for the last 1 day, filtered by hostname match. Show me the average Memory percent utilization per host for the last 1 day, filtered by hostname match. Show me the average loadAverageFiveMinutes per host for the last 1 day, filtered by hostname match. Show me the average Duration and Availability Percentage per monitor for all Synthetics checks in the last 1 day. This widget uses the APM Apdex Score metric, with the View by host setting disabled. Shows the overall Apdex scores for the App Server for the last 1 day. This widget uses the APM Error Rate metric, with the View by host setting disabled. Shows the combined error rate for all errors in the last 1 day. "nrql": "SELECT average(cpuPercent) FROM SystemSample TIMESERIES FACET `entityName` WHERE entityName LIKE '%hostnameFilter%' LIMIT 100 SINCE 1 day ago"
"notes": "WHERE entityName LIKE '%hostnameFilter%'"
"nrql": "SELECT average(memoryUsedBytes/memoryTotalBytes*100) FROM SystemSample TIMESERIES FACET `entityName` WHERE (`entityName` LIKE '%hostnameFilter%') LIMIT 100 SINCE 1 day ago"
"notes": "WHERE (`entityName` LIKE '%hostnameFilter%')"
"nrql": "SELECT average(loadAverageFiveMinute) FROM SystemSample TIMESERIES FACET `entityName` WHERE (`entityName` LIKE '%hostnameFilter%') LIMIT 100 SINCE 1 day ago"
"nrql": "SELECT average(duration), percentage(count(*), WHERE result='SUCCESS') FROM SyntheticCheck FACET monitorName SINCE 1 day ago"
NOTE: The application names and Monitor Names have been removed. This dashboard helps the operations team to determine the service SLA for each instance and farm weekly. It also helps us to find which is the client that has suffered any kind of downtime during the operation time. It also helps us to study the farms usage in order to plan any hardware upgrade needed. Required Products: APM, Synthetics, Infrastructure. The error count for each client application running on our farms. 400 and 302 are responses that we are waiting so that is why I’ve removed from the counter. The error count total compared with 1 week earlier. 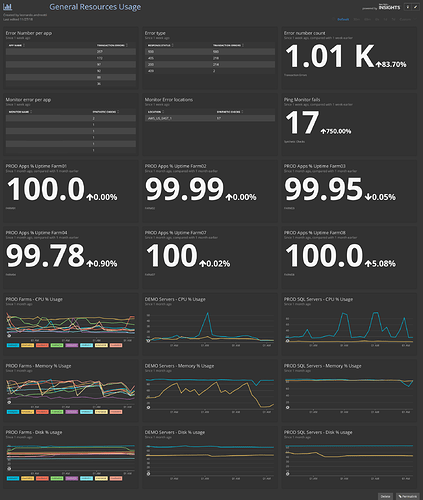 This is a basic dashboard that we have to monitor one of our stack deployments, these are displayed on many monitors around our building (for different stacks/DCs). From information shown (such as ‘Recent Response Times’) we can quickly gauge an issue in each stack - before diving in deeper. Are Data Apps considered valid entries for the contest? As long as you also include your value statement and the associated NRQL, I say yes! Please post Data Apps if you’ve got em! @adam.ahndan! My name is Sheik. I have shared my very favorite dashboard which is called “Know Your Customers (KYC) dashboard” which i built for an eCommerce application. Basically any e-commerce application will have a shopping experience and a buying experience. The purpose of this dashboard is to understand how our customers are experiencing our website when they shop and buy products and on what ways we can serve them better respective to their location, timezone and interest. Some of our NRQL which is wired up to alerts, we ignore the goings on in the early AM as that is when the syncing of our data across servers occurs. We have the above NRQL wired into alerts as well as synthetics pinging & logging in from around the globe. Hope this prove useful to someone out there. I plan on seeing whether I can use some of your NRQL to make it even better. Great product and great community, cheers. 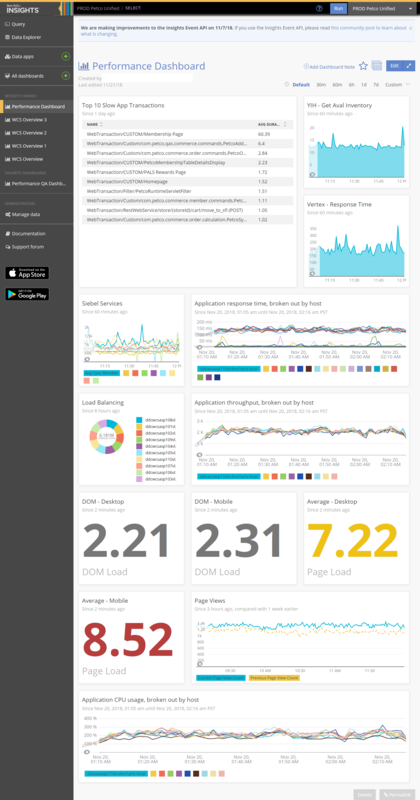 We started using newrelic to monitor A/B Tests regarding large scale performance improvements. This first A/B test was created as a proof of concept to see if the data would be useful. 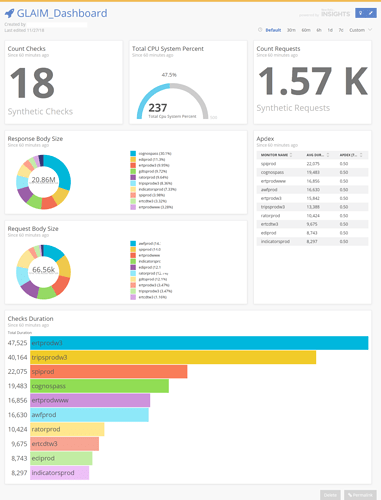 This dashboard shows the activity of the probes which monitor IBM Global Logistcs applications which are key to the business. *New Relic provides many built in dashboard but my requirement was to create dashboard and group them in single screen. I used data Apps in insights which is really very useful. I had more than 10 java micro services and Angular UI. I build dashboard for each of them using data apps and can navigate easily using tabs. so one place to track all my apps. If you see in above dashboard, i have API like user, config, order , gateway etc. and can navigate easily. Charts are standard charts of CPU, memory, Threads etc.